Defence giant BAE Systems is to recruit 140 engineering and business apprentices in Cumbria over the course of the year, the company has announced. 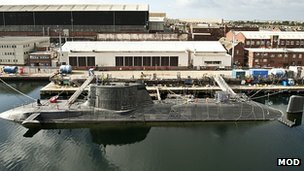 They will join the firm’s submarine-building business in Barrow, with a further 100 at its shipbuilding sites in Portsmouth and Glasgow. The company is building the Navy’s latest Astute Class nuclear submarines. A spokesman said attracting suitable apprentices was vital in generating the company’s “workforce of the future”. This entry was posted in UK Submarines and tagged Apprentice, Astute, BAE Systems, Barrow on February 11, 2013 by jasonlockley.